I am a walker. I love to walk and walk up to six miles a day. When walking, I usually have some type of question that I am pondering and it came to my mind this question…why do we create? I spend most of my day creating knitwear. I get up before the sun and start knitting or designing. It has become a part of my life. I don’t know what to do without it. I don’t sit and have a conversation with someone without my knitting. Of course my family thinks this is perfectly normal, I have been doing it since they were babies, although I wonder sometimes if others think me a bit odd. So walking the other day, I thought, where does this need come from? Is it a form of self-expression, a way to tell the world who I am without words? Well, yes, that might be part of it, but somehow I think it should be more, this thing called knitting is all consuming it take up 99% of my life and I love it. So, did I come into this world with the knitting gene and it was just turned on at some point? Maybe… would I have felt the same about some other form of artistic expression, I don’t think so. I have tried other things, quilting for example. Yes it is fun but it doesn’t provide me with the same satisfaction, I don’t come alive. And maybe that is the answer. 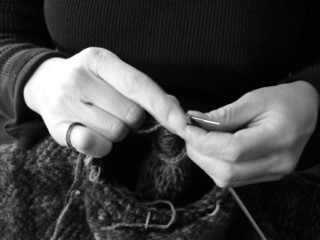 Knitting makes me feel alive and that is why I create. It has been there when life has been a struggle and I need to get through the day. It has taken away the loneliness and heartache. It has put smile on someone’s face when I give it as a gift. And I know that a little piece of me is with them when they wear that garment or work the pattern. It is my way of sharing myself with others in a quiet gentle way.